Khao San Road, Bangkok's infamous backpacker ghetto, isn't what I immediately think of when I'm jonesin' for an authentic taste of Thailand. The neighbourhood has long been a pit stop for shoestring travellers following the banana pancake trail through Asia-- a rabbit warren of hostels and expat bars full of farang looking for a cheap place to doss down, some cheap thrills and maybe a pizza slice or two to curb their hunger and homesickness. It never really endeared itself to me when I visited. Khao San Road skips Thai restaurant vernacular, speaking instead with a much more west-end accent in subdued earth tones and the occasional wooden inflection (dark for floors and distressed for tables), while a rotation of paintings from local artists adorns the far wall. It feels very urban loft and not out of place for the neighbourhood. 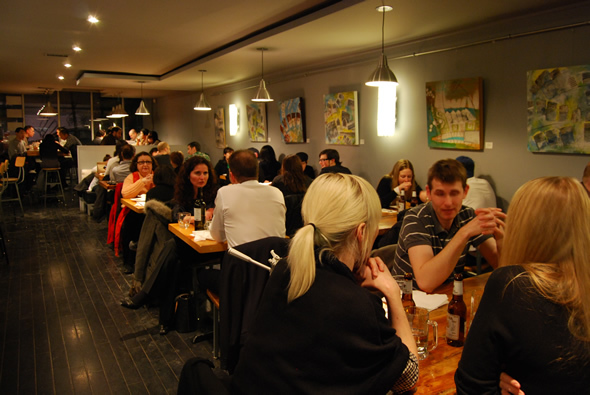 The flood of nightly patronage is a big part of the reason why the restaurant doesn't currently accept phone reservations (and you should show up in person to order take out for that matter). Even at 6:30 on a Thursday you'll be placing your Singha ($6) down on the bar between sips while you wait for your table. 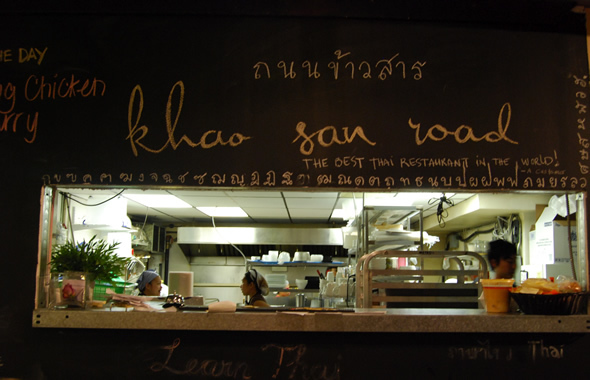 That's right, unlike Sukhothai, Khao San Road is licensed which is a nice touch since I rather enjoy a beer with my pad thai or curry. Generally not a fan of green curry (I find most versions in town unrefined, overcompensating with heat to mask a lack of flavour), KSR's is something special I'd gladly cross town for ($12 with a side of steamed rice). Generous chunks of chicken, crunchy green bell pepper and bamboo shoot ribbons are bathed in a creamy sauce rich with coconut notes giving way to a mix of kafir lime leaf smoky chili, galangal, and lemongrass. Each taste just different enough from the last to keep your palate thoroughly entertained. 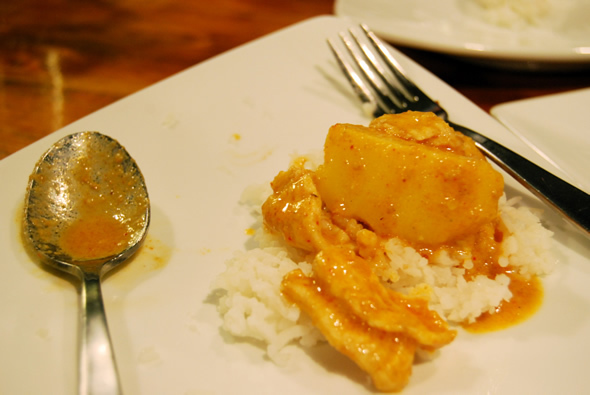 The mellower, yellow Massaman curry ($13 with a side of steamed rice) is equally complex and adds potatoes and, in our case chicken, for a thai take on stew sure to warm the winteriest of hearts. 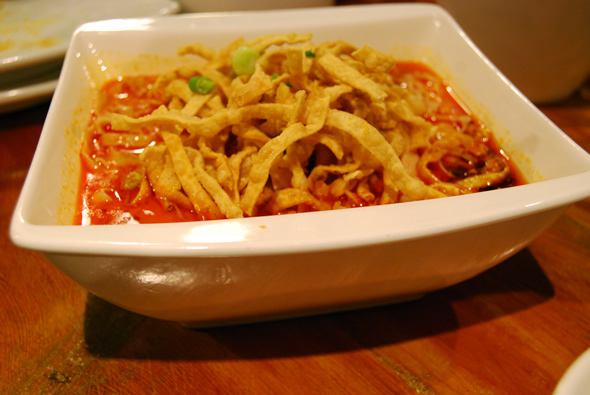 A similar creamy curry backbones the addictive broth bathing the chewy egg noodles of our chicken khao soi. 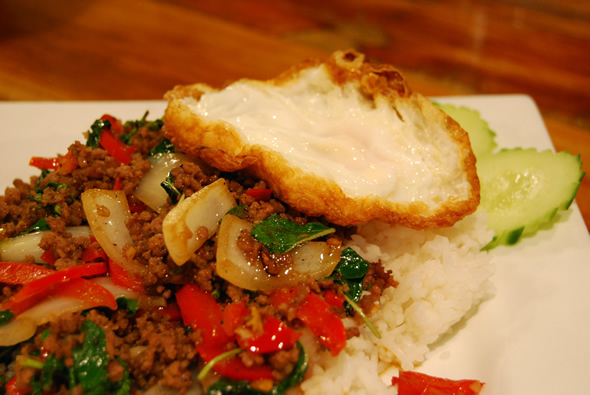 The minced beef with basil and a fried egg (Pad Gra Prao, $13) would be a welcome addition to any brunch. And the only thing missing from the street style pad thai ($13) is the ketchup since this real-deal version is the identical to what you'd find at hawker stalls and night markets from Chiang Mai to Koh Samui. 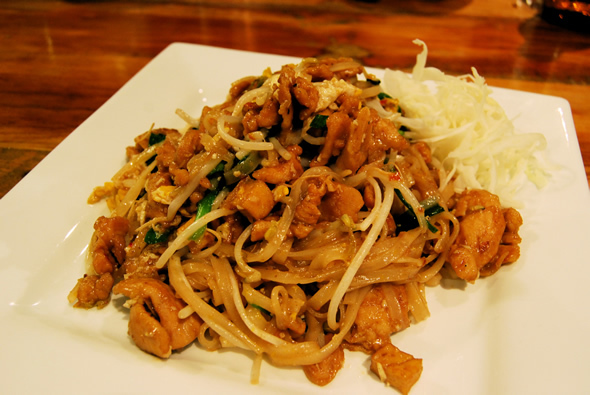 Our perfectly cooked rice noodles are stir-fried in the traditional tamarind, fish sauce, chilli and palm sugar dressing topped and with chicken, scrambled egg, sprouts and green onion. Sweet, sour, spicy, salty and definitely tastier than the sum of its parts. There's also insanely addictive Gra Bong squash fritters ($7). 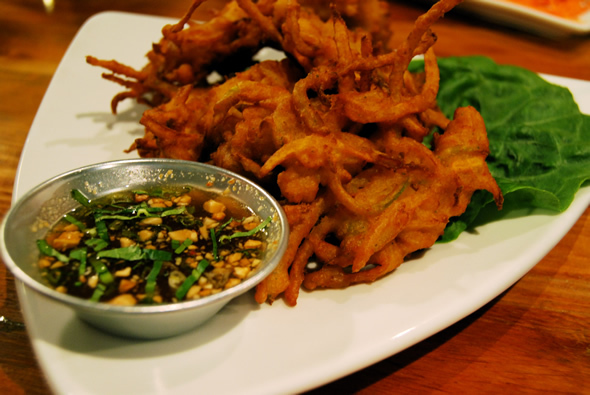 A cousin of the pakora that's sweet from the squash and spicy from a hit of red curry paste in the batter. It's crunchy deep-fried goodness and I can barely restrain the smile since eating these fritters is like discovering a new continent. Served with a sweet and sour tamarind sauce (made from scratch) a bucket of these would be the perfect accompaniment to beer and beach.